Garage door opener sensors work in a rather simple way. The sensors are installed at the lower parts of the garage's opening, one on each side, facing each other. They communicate via an invisible beam, and when something disrupts that beam, i.e. 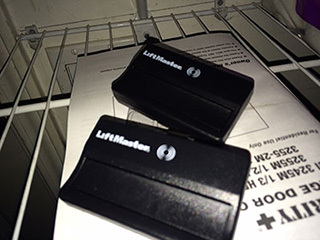 gets in the door's way, the sensors simply alert the garage door opener, and it reverses the door's movement or stops doesn't try to close it at all. As you can see, that's why when something is wrong with these photoelectric sensors the door isn't safe to use. Although not all that common, sometimes your sensors won't work because their wires are damaged or detached. You must check to make sure that they are properly connected to the opener and to a power source. Most modern sensors are equipped with LED lights that indicate whether or not they are working correctly via green or red lights. Another thing to look out for is the lenses. If they become scratched or get dirty, they won't be able to work properly, and may actually cause the sensors to falsely detect a problem, which may cause the door to reverse for no explicable reason. Misaligned sensors are a serious problem. If the position of these components isn't exact, they won't be able to detect an obstacle properly, which can cause someone to get seriously hurt. Sensor realignment is a delicate procedure, and rather than trying to do it by yourself, you should probably have one of our experts help you out. Opener sensor problems can be extremely dangerous, as your garage door may not be able to properly reverse if one or both of these components aren't working as well as they're supposed to. Our professional technicians at Garage Door Repair Delray Beach can replace or realign them for you if that becomes necessary.